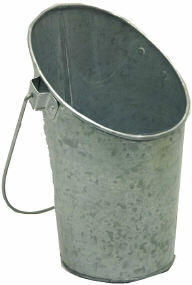 An adorable wall pocket pail that has a galvanized acid wash finish. This metal wall pocket can be used as vase, an optional plastic liner can be purchased to help prevent leaks when used with floral arrangements. The front of this wall vase is 5.25 inch high and the back is 8.5 inch high. Can also be used as decor, a gift item, to organize the home or office.